Prior to when College Main was closed off (June 19th 2012, a day that will live in infamy), it was the only block which was resembled a dense city in College Station. 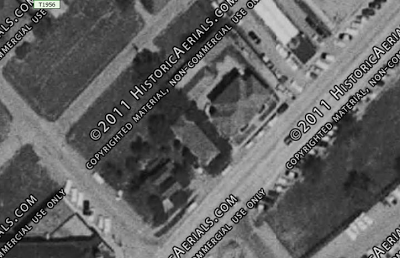 And sitting on the corner of this block was Loupot's (335 University Drive), which closed the same year (in March). 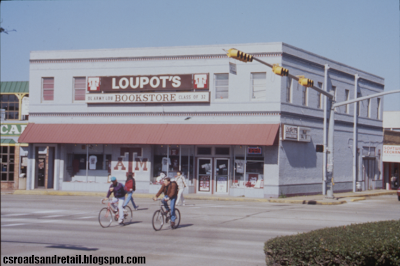 One of the oldest establishments on Northgate and once the "official" bookstore on campus, Loupot's had been around for years, though from what I've read, it wasn't always in the building, and when it was, it wasn't in both levels. From what I've found, it wasn't bought by Loupot until 1979, and in the past, Loupot's was named "Loupot's Trading Post" and "Loupot's Books & Britches". The upper level was added in the 1980s not too long after the building was bought, as that had been the previous home of an X-rated bookstore (The Adult Library, though I read an ad that mentioned it being the home of "Sun Theater", same business, different name). Some ads I had found (but sadly don't have a copy right now) mentioned that they had shows for a quarter (and escorted ladies were free), which was around in the 1970s and 1980s. This had an address of 333 University. The adult theater was upstairs at 333 University, with Loupot's downstairs. At some point, they eventually closed and Loupot's ultimately would expand upstairs. Anyway, Loupot's managed to expand to a few different locations, namely a location in Southgate (now home to TexAgs) and in a location at Holleman and Texas Avenue (now Salata). These closed shortly after the Northgate location. A fourth location was planned (according to a sign) to the grassy area just north of Blinn College on Villa Maria (where Blinn later added more parking). Loupot's continued to maintain its large store on Northgate, which later upgraded to electronic signage and made Internet history with its "reverse-boarded up windows" in 2005 (around the time of Hurricane Rita). However, in 2010, the family sold to Nebraska Book Company (Neebo), which already owned the Traditions bookstores (formerly Rother's), and then they started closing stores. The Loupot's-branded stores went away in 2012, but eventually, their other stores (Southgate, University Square, and one closer to Blinn at Briarcrest and Villa Maria) closed as well. One of their last messages on the message board was "HOLY CRAP!!! TEXTBOOK RENTAL SALE!!! ", which always felt a bit tasteless due to the mild swearing but that distracted from the fact that if they're selling rental textbooks, they're probably going under. The former Loupot's in 2013. It would be great to see the Loupot's on Northgate resurrected as The Loupot's Building and maybe get something decent or two in there, and not a bar: maybe dividing it into restaurants and shops, except the landlord is too stingy to do so. It was to become a place called Z Bar & Bistro, which made me hope it was something better than The Corner across the street (sticky chairs and tables, smells like old beer constantly, poor service), though it eventually fell through. As of early 2016, there appears to be some work going on at Loupot's. It will probably be a bar, but it's better than an empty building, right? Who loves old buildings? I do! I took these pictures of the 1932-built Scoates Hall in June 2012 shortly after renovation plans were announced (I think Scoates was last renovated sometime in the 1950s or 1960s, I have a hard time believing that a lot of what I was seeing was 1930s vintage). Unfortunately, I didn't have good picture taking skills or a good frame of reference to where these were (the floor plan threw me a loop, you can't directly access the two halves of the building, and even the second floor connections require some manuevering), so the pictures aren't entirely adequate. I can however tell you that the water fountain in one shot is totally gone, the stairs were reinforced with new guardrails (the old rails used to terrify me--especially since they were below a taller person's center of gravity), and the new hallways look nice and shiny, though of course something is missing. Check out the shots here, on Flickr. Courtesy of Project HOLD, a black and white photo. While not nearly as ancient as this suggests, it does represent a time gone by. 803 University. This is titled "The Building Formerly Known as Fitzwilly's" because that's what this was for 19 years. For many years, it was the place of good burgers, good wings, and good times, and I was saddened when it closed, partially because it stayed longer than anything that had ever been there before. 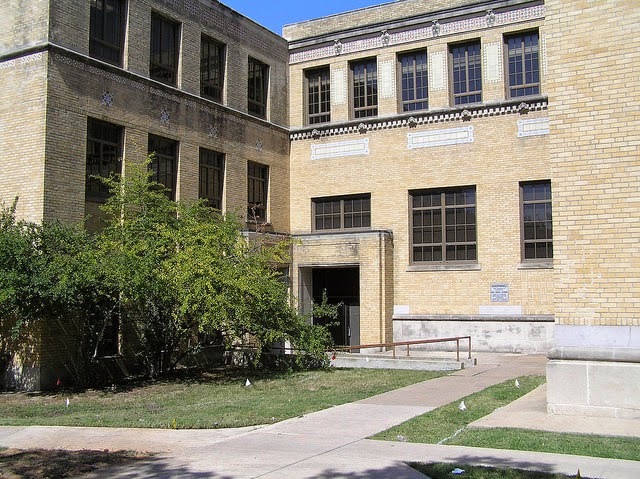 From approximately 1930 up until 1979, this building once held apartments, titled "The Varsity" (a TexAgs thread mentions it was the Alamo Apartments, but I believe I've found differently). From second-hand stories on TexAgs, the building was dilapidated (at least in the later years), the manager was the same woman for 44 years, and the building had no air conditioning or central heating. It's worth noting, though a lot of dorms on campus didn't have air conditioning either (Walton Hall didn't get air conditioning until the late 1990s, at least). It also didn't have a phone line, which led it to be excluded from phone books in the 1970s. The historic date and land use is backed up by city documents. 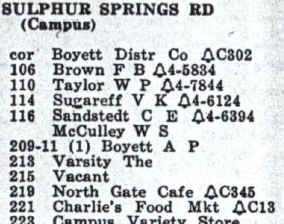 While the directory I have seen below is from 1939 (and a bit difficult to use since nearly every road name has changed, but the addresses have been renumbered). Inspiring "Varsity II Apartments" on Wellborn, perhaps? While I can't readily pull up an aerial from 1939 (they do exist, but not in a format I can readily use), the buildings on Northgate did retain the configuration until at least the early 1960s, and the buildings do align with the directory. In this picture, you can readily see where the Fitzwilly's building was. - The private residence to the southwest (where that Citgo station was) is the private residence listed (two addresses, possibly because of the two buildings). - The Varsity is the no-telephone building where Fitzwilly's later was. - The vacancy is where Dry Bean Saloon is now. - and finally, the building to the northeast is the famous Old Army "Charlie's Grocery", which finally disappeared in the 1980s after sub-dividing part of their store out to Texas Aggie Bookstore, which remains today (though in the 1990s had to make that "AggieLand"). 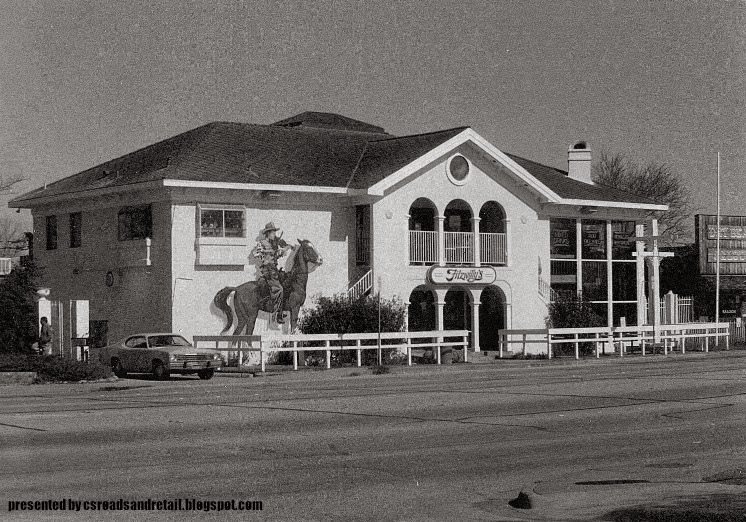 In 1979, the building finally was converted into a two-story bar but I've been unable to secure the names of said businesses very easily (a 1985 city directory even listed "Edward Jones", which is at 303 EAST University Drive). Luckily, capn-mac has his own chronology (I've also learned "Bogie's" was there as there as the last bar to inhabit the building before the "renovation" mentioned). 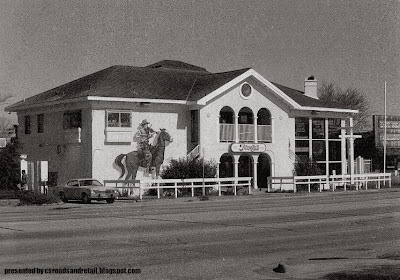 From what I have, in 1980, it was Alamo Bar & Grill, which probably (compared to the building layout today) a dump and far more obvious about its former status as a run-down apartment building it was before. There was also "Sebastian's Tavern" as well around 1982-1983, but Bogie's was in the 1983 phone book but not the 1984 one. It's possible that the building sat vacant for a bit before being renovated again (which would make since). The link posted above also mentions said "renovation" to the building, which is probably what made the building it is today: a skylight was added at about this point, and probably the interior was rebuilt to restaurant code. It was in this phase from the late 1980s (1987, perhaps?) 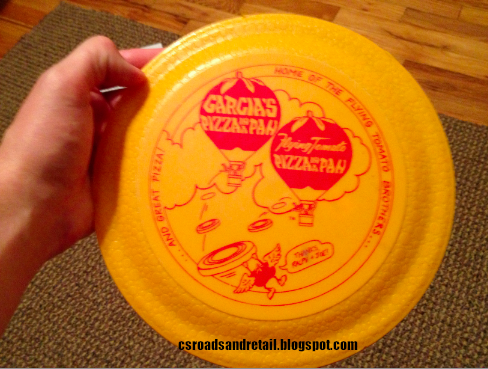 that it was the Flying Tomato Pizza (the city directory lists it as "Flying Tomato & Pizza-N-A-Pan"). By other independent sources, they had a hot air balloon that dropped Frisbees and other prizes. I don't know how I came across this, but it wasn't from this location, as by the time my family moved here, Flying Tomato was now Two Pesos. Two Pesos (not Dos Pesos, as I wrongly believed at one time) was a Taco Cabana knockoff (as briefly discussed here), which by all accounts was cheap and tasty. Not in the Northgate color palette. In 1994, it became what it would be known as for nearly the next 19 years: Fitzwilly's. Unfortunately, Fitz's, despite having good, cheap food (wings and burgers) fell out of favor with the Northgate crowd. Even when it wasn't crowded, service was slow (and also, food portions shrunk in the last year). It was still liked by an older crowd, but that's not what the Northgate landlords wanted, so the lease wasn't renewed and it went to the controversial Eccell Group, which has all but exited the Northgate area these days (Daisy Duke's has been sold, Café Eccell has moved, and La Bodega has closed as well). While not in the gaudy "cotton candy" colors of Two Pesos, The Backyard seems a bit boring. The Backyard is the name of the replacement, which has a far darker interior than Fitzwilly's, more expensive food, and other changes I didn't particularly like, and due to aforementioned color restrictions, the new owners just painted it the same dark beige tone we've seen everywhere else. I didn't take a picture of the back area of the restaurant--while Fitzwilly's had a few tables and some delightfully dated blinking incandescent lights, the newer facility's back area was significantly rebuilt. If you crave more Fitzwilly's pictures that are in color, you can visit the Yelp page. Since leaving college, I've heard The Backyard has revised its menu to add more sandwiches (the old menu was burgers and tacos). Finally, if you know for sure any bars missed, fill 'em in at the comments! Update 8-5-14: Removed the first paragraph about the last post or so, and also took out mention of the contest, which nobody won. Update April 2015: General maintenance to ensure continued relevance.